The latest version of the Matereality material data management system with its associated engineering apps and SaaS modules is now available to current Matereality users for pre-release testing. 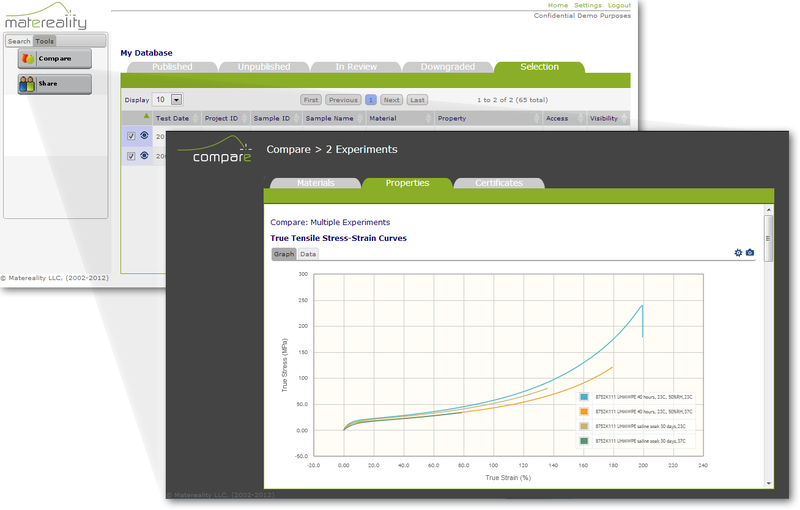 A new Compare module is introduced to perform comparison analytics among datasets. The software automatically analyzes a group of selected datasets and instantly provides graphical comparisons of all related properties, saving you considerable time that might have been spent performing cross-plots in Excel. Comparison analytics can be run against data of any complexity stored within Matereality. Access the Compare module within the My Properties and Workgroup Properties apps. Select two or more datasets; note that a new Selection tab appears, which displays only the selected datasets. Click the Tools tab (in the left pane), and click the Compare button. The DataViewer module has been updated with enhanced plotting capabilities, including the ability to capture high quality snapshots of material property graphs as images that are ready for use in papers and presentations. Statistical error banding is now available, which lets you visually gauge the spread of graphical data. Enhanced zoom allows you to examine areas of interest more easily, by setting explicit minimum and maximum values for either plot axis, or by changing either axis to log scale. These viewer enhancements are also implemented in the Compare module, Properties plots; and in the CAE Modeler app, Raw Data and Material Model plots. NOTE: Currently, the new Snapshot feature is available only when using the Google Chrome browser. Collaboration capabilities have been enhanced with the ability to select any collection of datasets and to share this selection with another user or workgroup. Now, even an entire project can be shared with a click of a button. The recipient receives an email that contains a data link, which gives them instant access to the selected datasets (subject to the recipient's Matereality registration). There are no attachments in the email. Access granted via the Share feature can be revoked later, if necessary. In a big change to data loading capabilities, users of Matereality's workgroup and enterprise solutions now have a way to publish their previously unpublished material data. Individuals can now transfer data they have loaded for personal use to a qualified Data Source, who can review and publish the data on their behalf. This creates a pathway for individuals to add and update data that subsequently can be shared widely or in a more restricted way as needed. The CAE Modelers for the injection-molding codes (Autodesk Simulation Moldflow, Moldex3D, Dassault Systemes Simpoe) are ready for testing. A new CAE Modeler for SolidWorks, which allows selection by study type and processing of all available SolidWorks material models, is now deployed as well. NOTE: CAE Modelers for Simulia (Abaqus/CAE), ANSYS, NX NASTRAN, Autodesk Simulation Mechanical (Algor) and LS-DYNA can be viewed in the alpha release but are not yet finalized in terms of analytical capabilities. 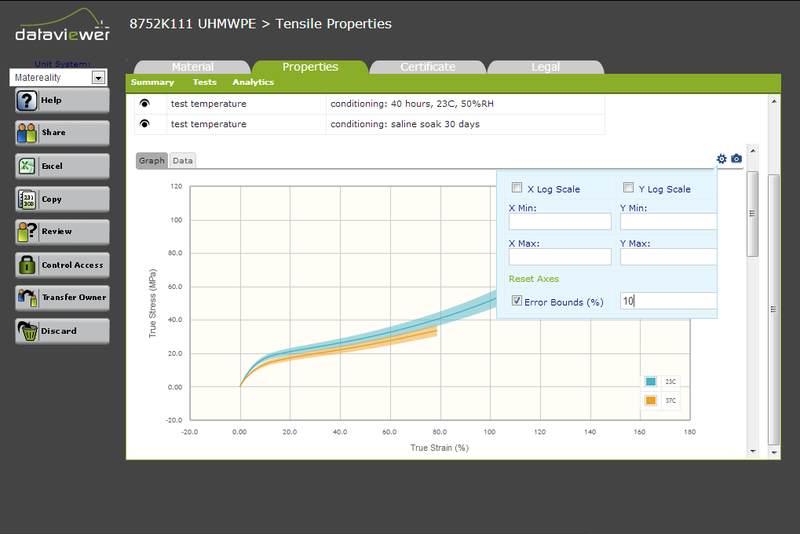 Some minor changes to the MyMatereality home dashboard have been implemented to enhance the user experience. The My Database and My Workgroup app names and icon images have been updated compared to Matereality Version 6.x. In Matereality Version 7, these apps are named My Properties and Workgroup Properties, respectively. Minor visual changes to icon images have been implemented for the CAE Modeler, Material Model Library and Data Loader apps. NOTE: The MyMatereality home dashboard is customized for each user. Depending on your registration type and access privileges, you may not see all of the apps shown in this example image.